Yahoo is launching new ads today. This fall the company launched a $100 million campaign with its vaguely worded “It’s You!” ads. But failing to see a return on that investment, Yahoo is shifting focus with the rest of its $85 million ad campaign. Yahoo, in contrast, positions itself as a place “that gets to know you.” For Yahoo to succeed as a portal (and to sell advertising), it needs to direct people to its homepage, which this campaign purports to do. But there’s one thing about its focus on Google that doesn’t work: do people really use Google as their homepage? Fair enough. 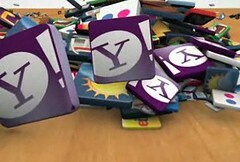 Touting Yahoo’s utility to users is one way to drive traffic to the site. The costly “It’s You!” campaign failed to do as much. After its completion, Yahoo has not improved its marketshare in search or its homepage traffic. The site has been steadily losing unique visitors since the September launch of the campaign, according to comScore. But while Google’s search dominance is undeniable, its utility as a homepage is less obvious. Sure, the company is constantly tweaking its logo for daily holidays, and just this week it streamlined the logo permanently. But when was the last time you realized any of that by going to Google.com? Personally, I find out about Google’s logo changes when someone writes about it. That’s because Google search has become so ingrained in the way we search the web that going to the homepage is rendered mostly irrelevant. If a search bar isn’t built into your web browser, it’s available on your mobile phone. When web users search something, going to the Google homepage is a superfluous step. looks a lot like what Yahoo is touting. It’s called iGoogle. That’s not to say I’m the typical web user. But I’d be surprised to see that a majority of Google’s actually see the Google homepage. Lifehacker did an informal poll about the Google hompage last year. And while 40% of respondents use the Google homepage “all the time,” more barely see it. 23% used it “only when I want to look at a big version of a Google doodle,” and 24% never used it. That said, maybe people who use Google as their homepage are a good target audience for Yahoo. Considering that there are plenty of ways to use Google without going to the homepage, they could probably use a little helpful guidance in getting around the web. No longer is brand marketing likely to remain the prerogative of conventional brand marketing organisations. Whilst these organisations have great strengths in creativity, planning and campaign delivery, they exhibit fewer strengths online where a host of brand association, experience and conversation takes place.